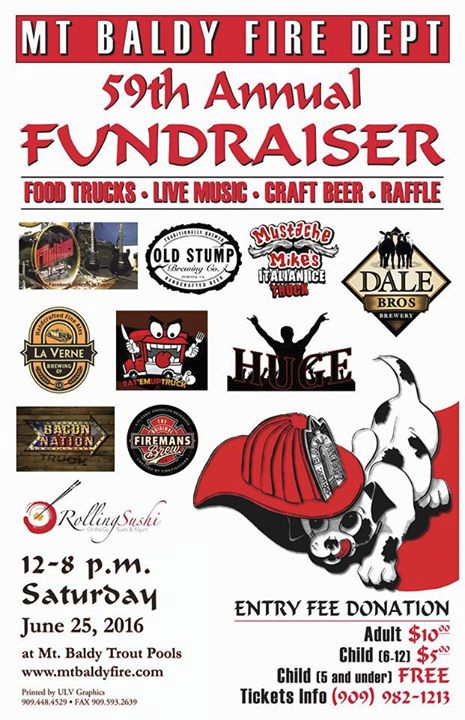 Mount Baldy’s 60th annual Fire Department fundraiser will be 3 to 9 p.m. today (June 17) at the Mount Baldy Trout Pools, 6945 Mount Baldy Road. Saturday (June 25) marks the return of the annual Mt. 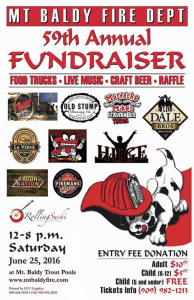 Baldy Fire Department fundraiser. However, this year, instead of the usual steak fry, they’re doing things a little differently – it will feature food from a small gathering of food trucks and craft beer from a handful of local breweries. Food trucks scheduled to participate include the Rolling Sushi Van, Bacon Nation, the Eat ‘Em Up Truck and Mustache Mike’s Italian Ice. This weekend — today in particular — seems to be the big weekend for German-style beer drinkin’ and eatin’. There are events happening from Palm Springs to Pomona. What better way to spend a Saturday afternoon than hanging out in the local mountains and sampling some delicious craft beer? 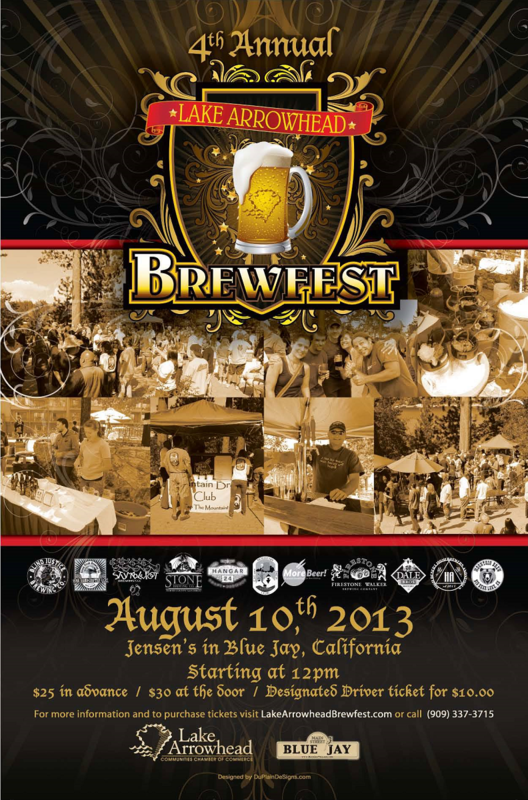 You can do that very thing this Saturday (August 10) as the Lake Arrowhead Communities Chamber of Commerce, Blue Jay Business Association and the Mountain Brew Club will be hosting the fourth Lake Arrowhead Brewfest in the parking lot of of the Blue Jay Jensen’s, 27264 Highway 189. The event will take place from noon to 6 p.m. Whether you’re a breakfast person or a lunch person, you can take advantage of discounts currently available for Mt. Baldy’s Top of the Notch restaurant. On a clear day, diners can see Catalina Island from the 7,800 foot elevation restaurant’s patio (although we haven’t been that lucky). 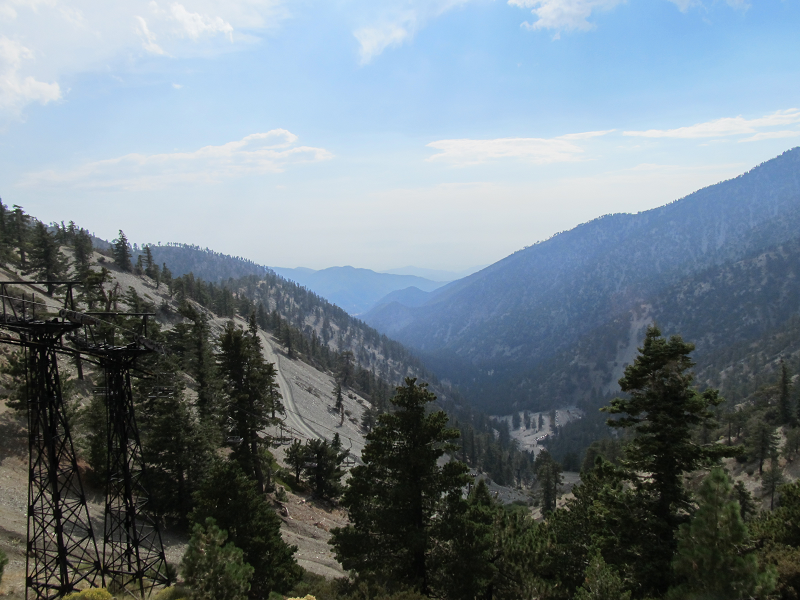 A short, easy hike away is a breathtaking view of the High Desert. The Wrightwood Chamber of Commerce’s seventh annual Chili Cook-off and Salsa Competition will take place from 10 a.m. to 4 p.m. tomorrow (October 6) at the Wrightwood Community Center and Park, 1275 State Route 2. This year, organizers are hosting a jalapeo eating contest and a town scavenger hunt in addition to the traditional chili and salsa contests. Salsa tasting is $3 per person and begins at 11 a.m. Salsa is judged in four categories: Hot, mild, pico de gallo and fruit. Chili tasting is $5 per person and begins at noon. Chili categories are: Red, green and anything goes. 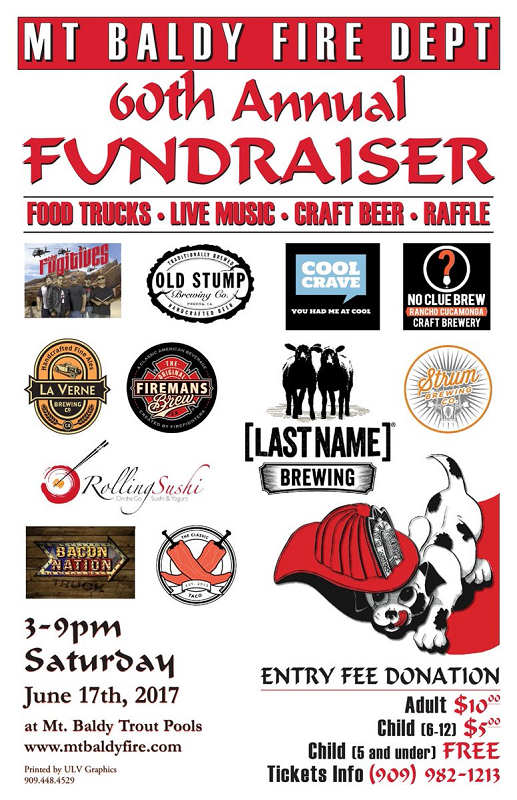 The event will also feature vendor booths, a beer garden, a 50/50 cash drawing, face painting and music by DJ Kev Dog. 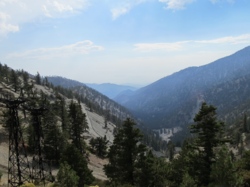 The cook-off is held in conjunction with West Coast Willys’ ninth annual Wrightwood Willys and Jeep Day that features close to 100 original and restored vehicles from as early as 1936. The Fall Wine Walk, sponsored by the Big Bear Lake Village Business Association, will take place from 3:30 to 7 p.m. tomorrow (September 15) in the Village of Big Bear Lake. Participants can stroll through village shops while sampling fine wines and enjoying light hors d’uvre. It appears that $30 advance tickets are still available here. Tickets will be $35 at the door, if available. A portion of the proceeds will be donated to Doves of Big Bear Valley and Mountain Strings of Big Bear. The event will be followed by a raffle prize drawing for event attendees. Guest check-in begins at 2:30 p.m. at the Christmas tree lot on the corner of Pine Knot Avenue and Village Drive. proceeds to be donated to Doves of Big Bear Valley and Mountain Strings of Big Bear. great wines, wonderful hors d’oeuvres, music and the mountain air and lake views. terms of funds raised and donations. A current Travel Zoo offering is an all-you-can-eat breakfast at Mt. Baldy’s Top of the Notch restaurant for $17. The price includes a round-trip chair lift to the 7,800-foot level where the restaurant is. Normally, the breakfast alone is $17.95, and the round-trip chair lift is another $20. Breakfast is served from 7:30 to 11 a.m. on weekends, and the vouchers can be redeemed through October 28. This past weekend, we took advantage of a similar lunch deal and had a great time…more on that later. For more information, or to get in on this deal, which you have until Thursday (September 13) evening to take advantage of, click here. Tickets are available now for the third annual Lake Arrowhead Brewfest. The event will take place from noon to 6 p.m. Saturday, August 11, in the parking lot of Jensen’s, 27264 Highway 189, Blue Jay. 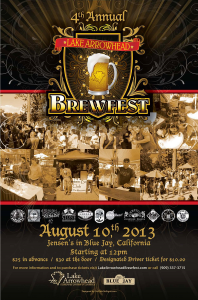 Beer lovers will be able to partake in unlimited samples of brews from several Southern California breweries and brew clubs, including the Mountain Brew Club, Hangar 24 Craft Brewery, Inland Empire Brewing Company, Big Bear Mountain Brewery, Dale Bros. Brewery, High Desert Home Brewers Anonymous and Beer, Beer and More Beer. Tickets, which include admission, beer tastings, and entertainment, are $25 (plus $2.37 service fee) in advance, and will be $30 at the door. In addition, a designated driver ticket is available for $10 (plus $1.54 service fee). The first 500 ticket purchasers will also receive a souvenir glass. The Lake Arrowhead Communities Chamber of Commerce and the Mountain Brew Club are co-hosting this event, which will feature food from Jensen’s. Proceeds from the food sales will benefit the Blue Jay Business Association. The Blue Jay Jazz Foundation will be providing live music.